TS Degree Final Seat Allotment for Intra (with in) College Sliding-III Results 2018: DOST Seat Allotment 2018 Final list Will be announced on 30th or 31st july. The aspirants can go through the DOST Official website, dost.cgg.gov.in to check the TS Degree seat allotment information. The Telangana State Council of Higher Education (TSCHE) has notified about DOST TS Seat Allotment 2018. Candidates can go through the article for more details. 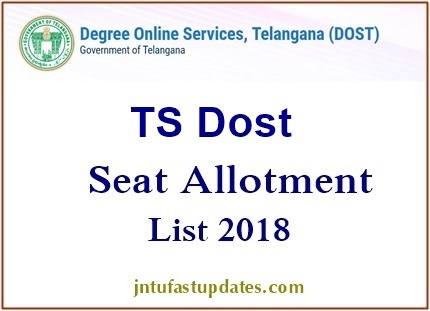 The Telangana DOST Degree Seat Allotment 2018 to be announced on 10th july. The TSCHE Vice Chairman was appointed as the convener of DOST for executing the seat allotment process in degree courses. Students can get admission into various Degree colleges such as government colleges, autonomous colleges, private colleges and aided colleges in Telangana. The TSCHE is monitoring the DOST admission process in the state of Telangana. The Degree Online Services of Telangana (DOST) will offer Degree admissions across Telangana in around 1200 colleges and six universities. The DOST Offers admission in Telangana University, Satavahana University, Osmania University, Palamuru University, Mahatma Gandhi University, and Kakatiya University. 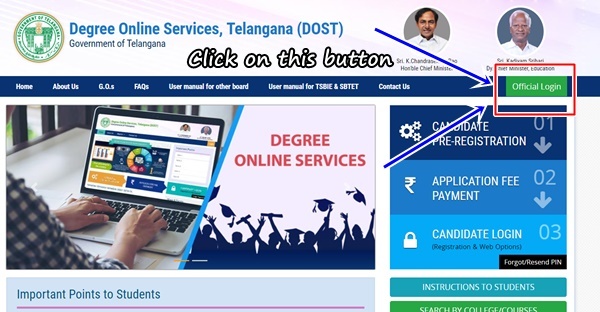 The Telangana DOST has issued notification for Graduate Degree admissions on 8th May while the online applications were accepted until 30th may from aspirants seeking admission. The TS DOST Seat Allotment is to be held on 4th June 2018. Final round list to be released on 17th july. Approximately 1.5 lakh students were applied for DOST while there are 4 lakh of seats were available in TS Degree colleges. The DOST First allotment list will be announced on 4th June and for candidates appeared for supplementary examinations the counselling will be held for 2nd and 3rd rounds. How to Check Telangana DOST Degree Intra Final Seat Allotment? check the above image and click on “Official Login” button. after successful log in, you will see the allotment results on top of page. The students those have applied for admissions can check the seat allotment result from DOST official portal, dost.cgg.gov.in. Candidates have to login to the portal and can check their allotment status/ allotment list. If students have already chosen the colleges at the time of registration, then the allotment will be done of the premise of marks obtained by them. DOST is going to publish the seat allotment list on 31st July. Students can accept the seat allotted by DOST or they can proceed for 3rd round seat allocation to get admission in their interested college. Students have to pay the requisite admission fee to confirm the college. Students who get admission in the college have to report to the corresponding college on or before 4th July 2018. Candidates those have allotted seat will be informed through SMS on their registered mobile numbers.